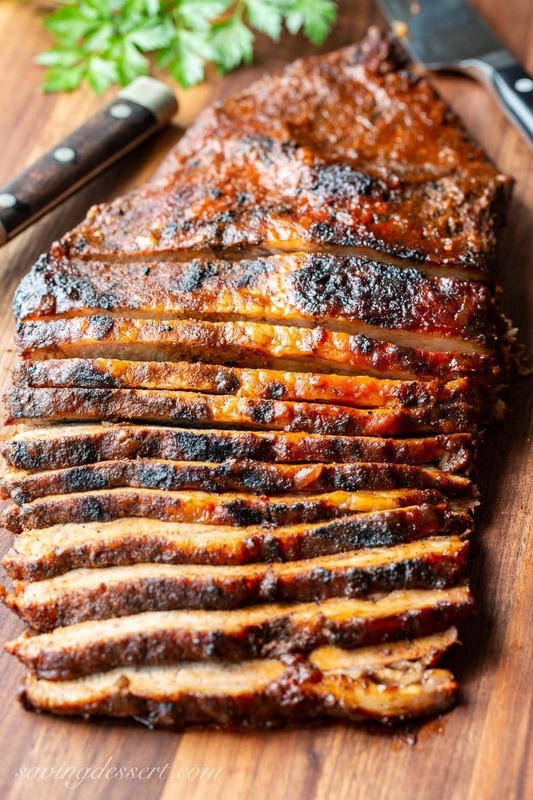 BBQ Brisket Recipe – making delicious, tender and juicy beef brisket is easier than you think! We love good BBQ; you know the kind that has been massaged with an amazing spice rub and slow-smoked for hours. There is an art and a science to smoking meat and when it comes to babysitting a smoker all day I prefer to leave it to the professionals. However, that doesn’t mean we can’t enjoy a GREAT BBQ Brisket Recipe at home in just a few hours. This easy, fool-proof method is a wonderful way to get exceptional results with very little effort. All you need is a grill and an oven, a good spicy dry rub and some seriously delicious sauce, and I can help you with the rub and sauce! The brisket is coated in the dry rub, then grilled briefly to char the outside and seal in all those wonderful flavors. 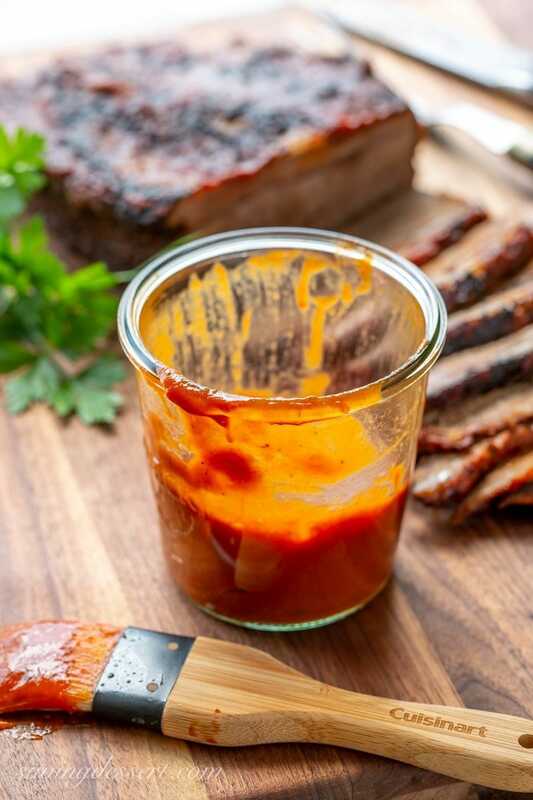 Place the browned brisket in a 13×9 inch ovenproof pan and cover it with a cup of our Easy Honey BBQ Sauce. The pan is wrapped tightly in foil and baked in the oven for 3 hours. That’s it! Sounds pretty easy right?! Beef brisket usually comes in a very large slab, about 3 to 4 pounds each, and is easily found in most grocery stores. 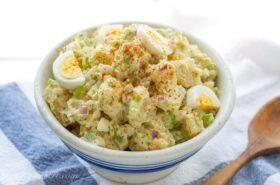 It can feed a small crowd which makes it great for parties, events and family gatherings. 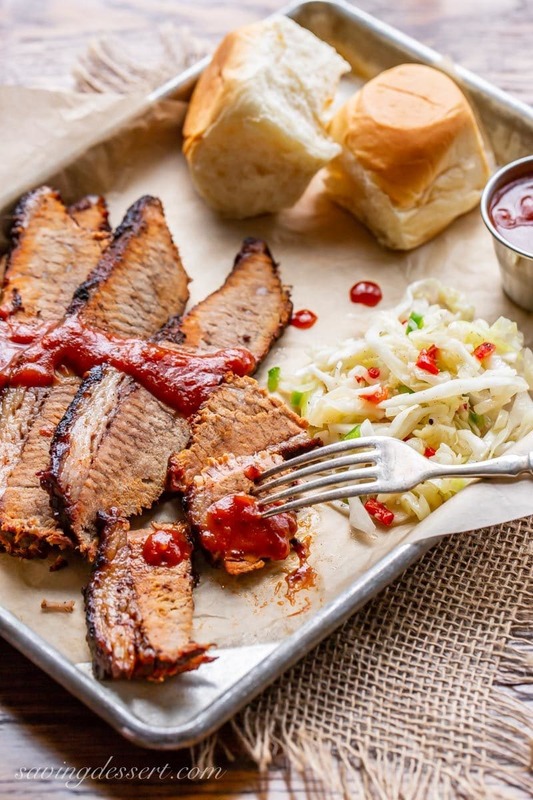 We’re getting ready to head to the beach for a late summer vacation with the whole family, and this Brisket Recipe is absolutely on the menu!. I’ve been tweaking and perfecting this recipe for years to add more flavor and to get consistently wonderful results. This recipe is a winner, grilling friends! 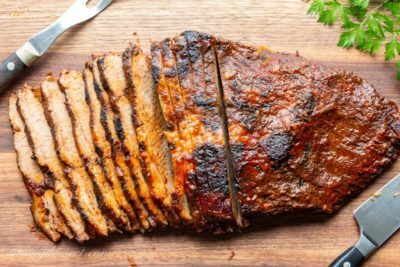 Our beef brisket recipe yields incredibly tender, juicy results so you don’t even need a knife to cut it. You can easily pull each piece apart with your fingers and it practically melts in your mouth. Fork tender and very satisfying for those of us that love a good piece of beef. 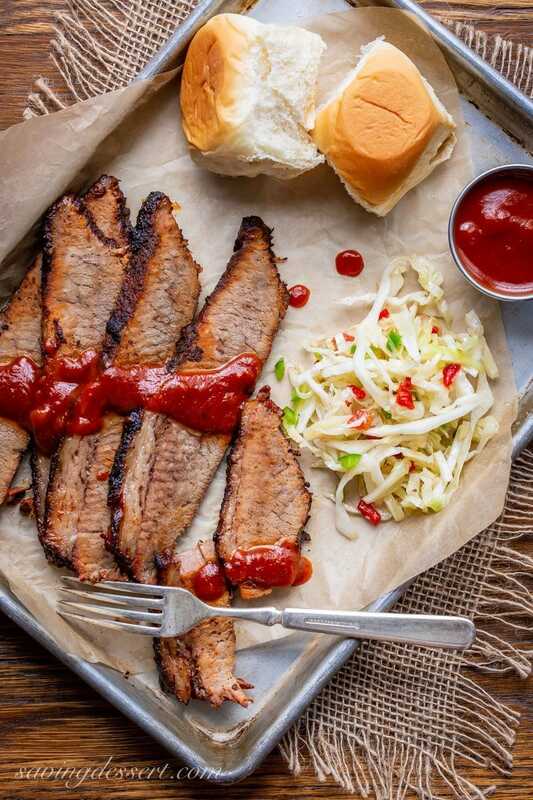 I recommend serving the brisket with an extra helping of our Easy Honey BBQ Sauce and a pile of our mayonnaise-free Super Cole Slaw Recipe. This is summer BBQ at it’s best folks! Guess what you can do with leftovers, if you’re lucky enough to have some?! 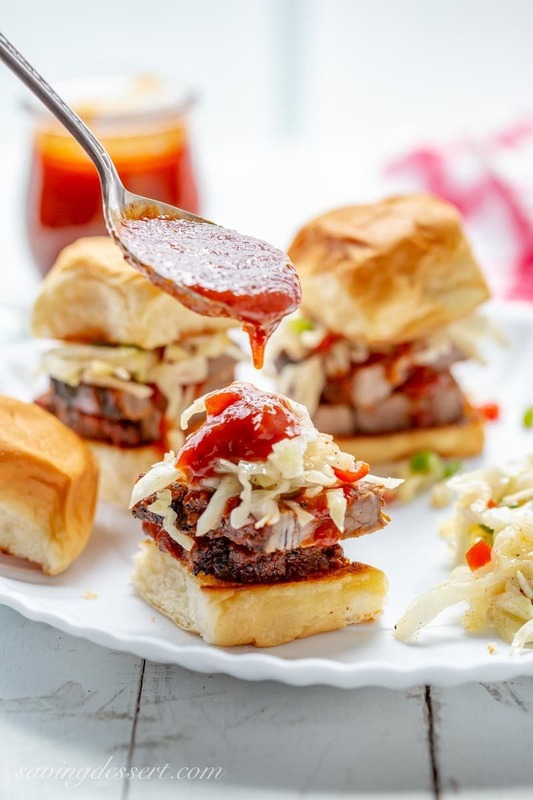 Brisket sliders of course 😉 Toasty little buns, plenty of tender brisket, crunchy slaw and sweet honey BBQ sauce – just wait for the marriage proposals to start pouring in. It’s the perfect party food all around! Keep this in mind for your fall events too, since football and tailgating seasons are just around the corner. Let’s be grilling friends! 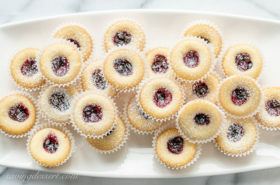 If you try our recipe please leave a comment, and photo if you have one, on Pinterest. If you share on INSTAGRAM use the hashtag #savingroomfordessert so we can stop by and give your post some love. And we’d be so happy if you would FOLLOW Saving Room for Dessert on FACEBOOK| INSTAGRAM| PINTEREST | TWITTER and subscribe to our YOUTUBE channel for all the latest recipes, videos and updates. For this delicious BBQ Brisket Recipe we used our Easy Honey BBQ Sauce for both cooking and serving. 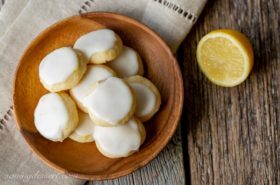 Click HERE to get the easy recipe. 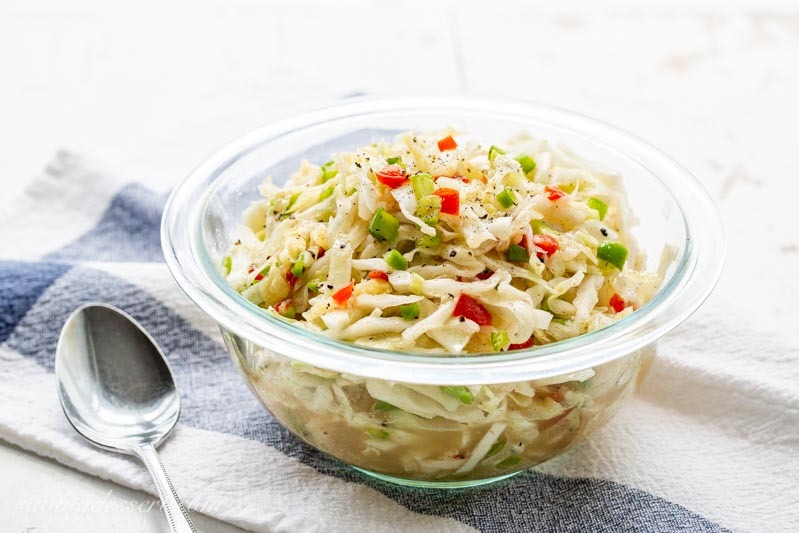 We’ve been living on this Super Cole Slaw Recipe (no mayo) all summer. 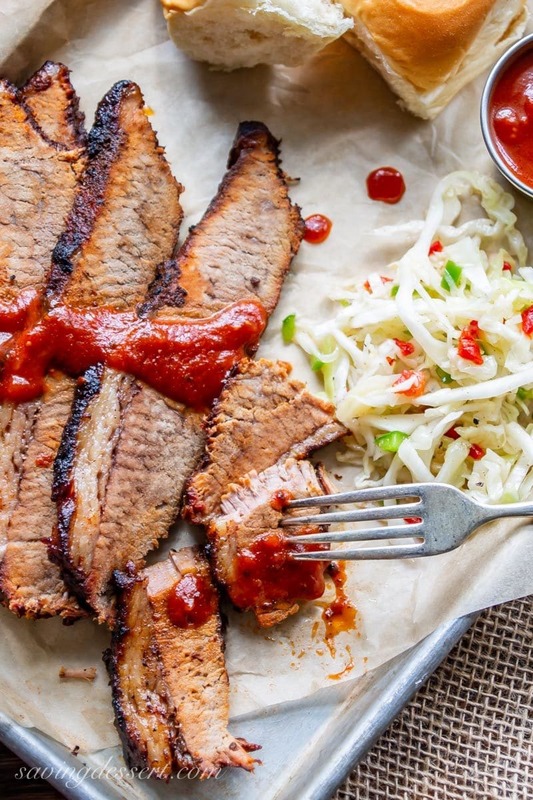 It’s crunchy, healthy, and goes great with this BBQ Beef Brisket Recipe. 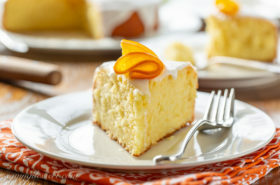 Click HERE to get the simple recipe. Juicy, tender, flavorful beef brisket, enough to feed a small crowd. Mix together the brown sugar, chile powder, cumin, salt, garlic, pepper and cayenne. If desired, trim the fat cap on the beef brisket to about 1/2-inch thick. Dry the brisket with paper towels then rub the spice mixture all over the beef, on both sides. Set aside while heating the grill. Preheat gas grill on high for 10-minutes. Turn the heat down to medium-high. Place the brisket on the grill and cook until it is charred and crusted, but not burnt. Turn and continue grilling on the other side until well marked. The fatty side of the brisket will cause flare-ups as the fat renders and drips. Watch the beef carefully so it does not burn. Once browned on both sides, place the brisket, fat side up, in an oven-proof 13x9-inch baking pan. Pour 1-cup of BBQ sauce over the top and spread to cover. Seal the pan with two layers of heavy duty aluminum foil. Bake at 325F for 3 hours. Remove from the oven and allow the meat to rest for 20 minutes. Remove the foil and place the brisket on a cutting board. Discard the juices or see notes below. Slice thin and serve with additional sauce if desired. Serves 8-10 depending on how hungry you are! Substitute your favorite smoked chili powder for the ancho. If you don’t have a grill, you can cut the brisket in half and brown in a very large skillet on the stove-top for similar results. Grilling adds a lot of flavor so it will not be exactly the same. I recommend using an electric knife for easy slicing. If you prefer to save the drippings after baking, first skim off all the fat. Add a cup of BBQ sauce to the drippings and heat the mixture in a saucepan until simmering. Serve with the beef if desired, or dip each slice in the mixture before serving. We prefer to serve with thick sauce on the side as shown in the photos and discard the drippings. 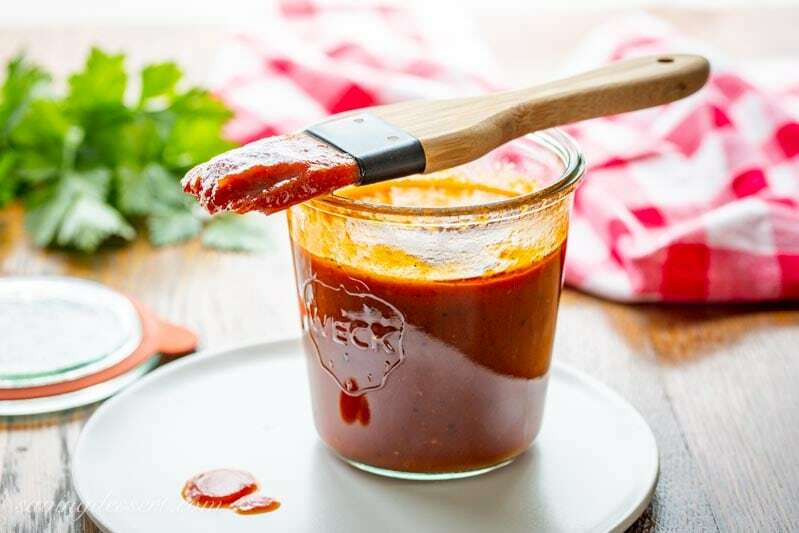 We use our Easy Honey BBQ Sauce Recipe for basting and serving. Click HERE to get the sauce recipe. Just had family get together and wanted to thank you for providing great recipes that I followed exactly and that were delicious. We had the bq brisket with your wonderful rub and honey bq sauce. Also made the super (mayo free) cole slaw. Everything was a family hit and my daughters called to say that the leftovers are just as good. I added other sides, like roasted Yukon potato bites and pintos. I am so happy to have found your site. Your photography is what caught my eye but now I know your recipes are just as appealing. Hi Jennie – I just finished doing a happy dance all over the house! Thank you so much for trying our recipes and most of all, thanks for taking the time to let us know how it worked out for you. 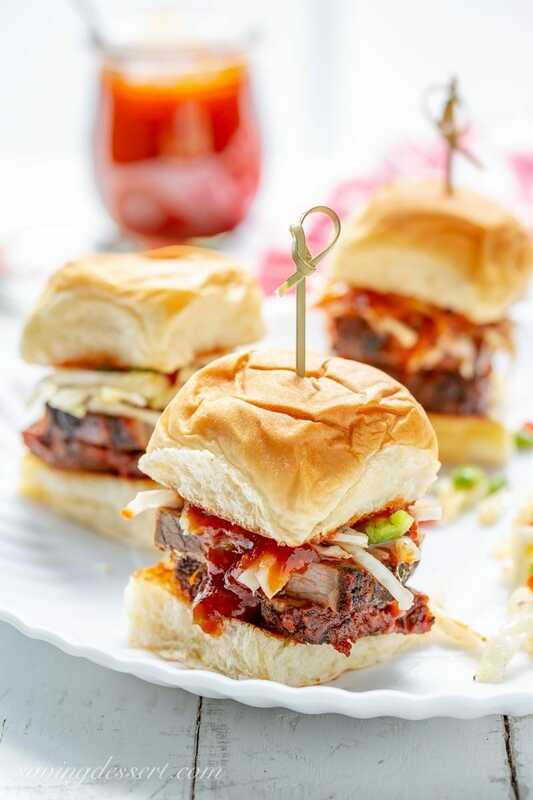 I LOVE these recipes and that brisket is so tender and delicious, I could eat it once a week! You made my day 🙂 Woohoo!!! The total cooking time says 2 hours 20 mins but the instructions say 3 hours in the oven and 20 minutes rest. Which is correct? Thanks for catching that Lillian. The cooking time is 3 hours – I messed up the math when calculating for the header information on the recipe. Thanks! I love brisket and, since we don’t have a smoker, I love your part gas grill and part oven method! Another keeper, Tricia! It’s really delicious Susan and if you’re stuck on that smoky flavor, add some liquid smoke to your sauce. Thanks! Wow, what a wonderful feast this is! We fell in love with brisket in Austin this spring and now I’ve been buying one regularly and trying different techniques. Can’t wait to try yours, Tricia! Brisket from Texas probably can’t be beat Chris. Thanks – hope you love it too! This looks so good. It’s something I’ve never tried making at home yet! Can’t wait to try! Thanks Lori – bet you love it too! I love brisket and make it about 4 times a year for my family. Your recipe sounds so flavorful, I’ll have to give it a try. Thanks for sharing. My husband does all the barbecuing in our family. 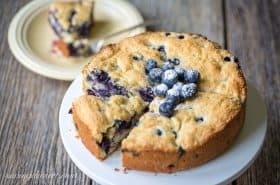 I have to show him this recipe. Unfortunately, I have never barbecued myself. Your brisket would be perfect for a larger crowd. It’s nice for a small gathering, so you can have leftovers! Hope your husband gives it a try Gerlinde – thanks so much. Hi Monica – this is so easy I know you would be surprised, and thrilled with the results! Hope you’re having a great summer. Oh, gosh, does this sound amazing! I seem to save brisket for the winter, but this is a must try recipe. Time to add brisket to my shopping list! You are simply the best!! All those bbq/grilled recipes with your homemade bbq sauce are amazing! Thanks Angie – we’ve been grilling it up this summer – almost ready to go back to vegetable soups for fall. Always thinking ahead!